A Dangerous Woman: Subversion and Surrealism in the Art of Honoré Sharrer is the first exhibition to fully reveal the formidable voice of this female artist. Honoré Sharrer (1920–2009) was a major art figure in the years surrounding World War II. With equal part wit, seduction, and bite, her work presents a potent and often unsettling critique of the conventions of American culture. Sharrer was in many ways a rebel whose paintings marked covert but unflinching resistance to the oppressive political and social conventions of the Cold War era. 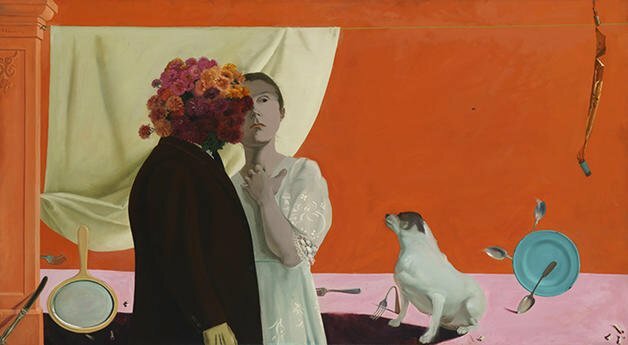 Her gender, commitment to leftist ideals, and use of figurative surrealism put her at odds with the dominant political and artistic climate of the 1950s. This exhibition provides a comprehensive examination of Sharrer’s place in American art and reveals the full scope of her significant achievements. A Dangerous Woman includes some 45 paintings spanning the artist’s career, plus associated sketches, prints, photographs, and ephemera from the artist’s extensive archive.